Synopsis: One month every year, five highly competitive friends hit the ground running in a no-holds- barred game of tag they’ve been playing since the first grade. 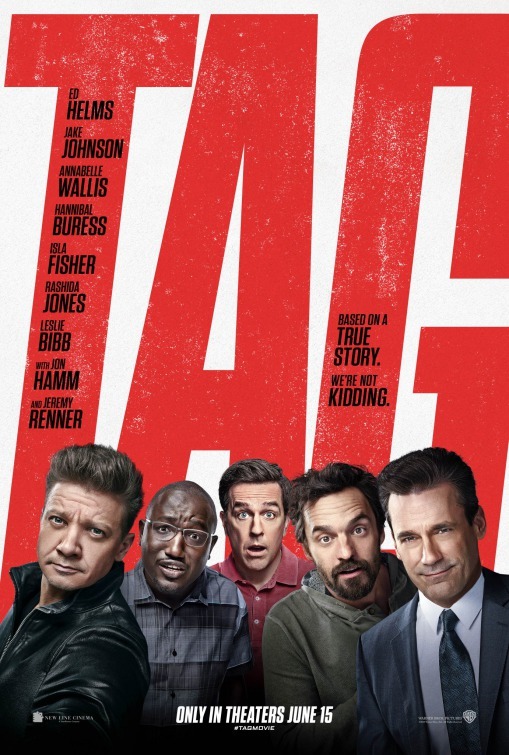 Review: In their marketing, the studio releasing Tag is making a big deal of pointing out it’s based on a true story which, miraculously, is correct. That’s the first and last genuine thing about Tag, a dreary supposed comedy that manages to take an interesting kernel of inspiration and turn it into a childish game no one will want to play a second round of. Based on a story first reported in a 2013 Wall Street Journal article (and nicely profiled in a segment on CBS Sunday Morning), the original subjects fielded so much interest in their story they quickly cashed in on a deal for Hollywood to buy the rights to their curiously ongoing game. Tag uses the basic premise of the shenanigans and takes heavy liberties with the storytelling as it follows five forever friends that have been playing the same game of tag one month each year for over three decades. When one of the members who has never been “It” decides to quit, the other four scramble to get their hands on him before the month is up. Problems arise when the quartet arrives to find their tricky target in the middle of his wedding weekend…but will that keep them from doing anything and everything they can to pass the touch and break his winning streak? Oof…where to start with this? Proving the bro-tastic juvenile antics of middle aged men in arrested development is a genre that’s still alive and kicking (even after the diminishing returns of The Hangover trilogy), Tag is a rare film that produces absolutely no likable characters for any audience member to latch onto. None. Starting at the top, there’s the usually affable Ed Helms (Vacation) as Hoagie, a sad-sack holder of the eternal tag flame who seemingly does nothing but wait until the yearly event to get his game on. At the start of the film, he’s applying for a job as a janitor just to be able to tag his corporate friend Bob (Jon Hamm, Million Dollar Arm) and get him onboard with the plot to tag Jerry (Jeremy Renner, The Bourne Legacy). Your enjoyment of the film will be determined in these opening minutes between Hoagie and Bob – it’s a litmus test of how much lame-brainedness you’ll be able to take for the next hour and a half. With Bob, Hoagie’s wife Anna (Isla Fisher, Now You See Me) and a Wall Street Journal reporter (Annabelle Wallis, Annabelle), ahem, tagging along, they recruit tag buddies Randy (Jake Johnson, The Mummy) and Kevin (Hannibal Buress, The Disaster Artist) and make their way to Washington state. It’s there they plan to nab Jerry, who has been expecting the arrival of his old friends for one last round before he settles down with Susan (Leslie Bibb, Iron Man). The resulting antics follow the gang as they repeatedly try to outsmart Jerry who manages to stay a few steps ahead and just out of reach. Making his big screen directing debut, Jeff Tomsic may know his way around some cleverly staged bits of entrapment but too often he places the camera directly on his actors…someone should have told him the GoPro business is so 2012. No one is helped by Rob McKittrick and Mark Steilen’s staid screenplay that features expected developments and one remarkably tasteless joke the film returns to so often the audience literally began loudly groaning each time it was brought up. Director and screenwriters don’t bother fleshing out any of the characters, nor do they explain how 47 year old Hamm and Renner were in the same class as 44 year old Helms, 40 year old Johnson, or (yikes!) 35 year old Buress. Sure, movies are allowed to be silly and we’ve totally had enough films to stock a small college dorm room DVD library featuring men behaving like children – but I guess I’m just bummed Tag didn’t aspire to be anything more than a stupid time waste. They at least could have presented some halfway decent characters for the cast to dive into. Johnson’s (exhausting) character is a stoner who puffs away the entire movie and then thinks he’s somehow appealing to an old flame played by Rashida Jones, Decoding Annie Parker, in a part so thankless she literally should have actually been thanked in the closing credits. Then there’s Wallis’ reporter who just drops her story on Hamm’s questionable corporate ethics to report on this tag battle. She must have had a giant per diem she’s willing to blow as she hops around the west coast with a group of dumbbells. Aside from Bibb’s entertaining but slightly manic turn as Renner’s fiance, the only person that manages to eek a shred of kudos here is Fisher. By-laws prevent “girls” (ugh) from playing so she’s the pitbull wife egging her husband and his friends on, all the while gnashing her teeth in desperation at wanting to play. Her foul-mouthed rages provide some muted laughs and much like her role in Keeping Up with the Joneses (another one Hamm snoozed his way through) she’s proven more than capable of being the most interesting person onscreen. Come to think of it, I’d have much rather seen a female version of this story…but maybe we’ll get a remake in 10 years with Sandra Bullock in Fisher’s role.